Utterly sarcastic, but an expert junior high school pitcher, Enjiro Haimura. Due to the large debt his house carries, Enjiro had been giving up of continuing on to high school. Where then suddenly, a girl appears with a bizarre proposal to him that begins turning the gears to his dreams again! Use that "smoky" pitch to open up the path to the future!! The plotting and scheming road to *Kōshien, begins!! *Kōshien - Where the stadium of Japan's national high school baseball tournaments is held. 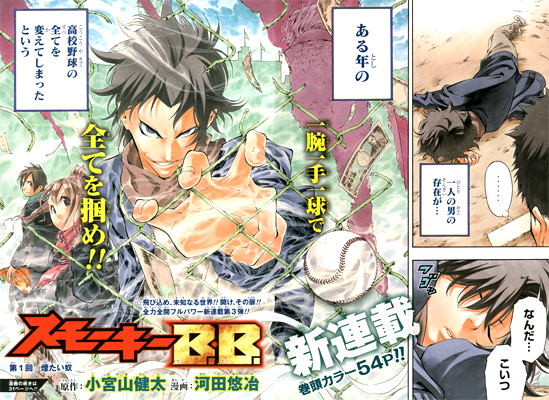 In 2010, Koimyama and Kawada had a series in Weekly Shonen Jump called Kikai-Banashi Hanasaka Ikkyuu. However the series was short lived as it failed to meet expectations of readers and editors alike. Their new series, Smoky B.B. began running in Weekly Shonen Jump volume 26. The artwork by Kawada seems slightly more dynamic than that of Kikai-Banashi Hanasaka Ikkyuu. Hopefully the plot (which was the major fact in Ikkyuu being cancelled), by Komiyama, develops well and becomes more and more interesting.